Two teams have already qualified for the semi-finals as Portugal beat Poland on penalties as the extra time ended at 1-1, the second quarter final was between Wales and Belgium in which Wales won by 3-1 to set-up a semi-final clash with Portugal. France and Iceland will play their quarter final tomorrow. 03rd July 2016 at 00:30 (IST). Germany is probably the strongest team at the Euros, and one interesting fact is that they are the heaviest team here with an average of 80kg. The team is very strong in all areas, starting from their keeper, Manual Neuer, who has already pulled remarkable saves in this tournament, then their defense is also very strong with the likes of Boateng, midfield is very talented with players like Kroos and Ozil and in the attack, they have Muller & Gotze. They have scored six goals out of the 78 shots on the goal. When you talk about Germany, you don’t just talk about any single player because of the simple fact that one player cannot win you a tournament, but a team can and that’s precisely Germany are doing now like they did in 2014 FIFA World Cup. They played their Round of 16 matches against Slovakia and demolished them as they beat them by 3-0, Boateng scored an absolute beauty in the 9th minute of the game, then in the 43rd minute Mario Gomez made it 2-0 and finally in the 63rd minute Julian Draxler made it 3-0. These teams have met 20 times before in which Germany have won five times, Italy won 11 times, and four matches were drawn. Italy beat them in 2012 by 1-2 in the Euros, then in 2006 World Cup they drew and in Euro 1996 they drew again by 0-0. Italy has been very disciplined throughout this tournament, they have scored five goals out of the 35 attempts on goal, and it is the least attempts after Iceland from the teams that are playing in the quarters. Italy has been strong and was the most underrated team at the Euros but have proved their competence and should keep performing like this. Neuer, Kimmich, Boateng, Hummels, Hector, Khedira, Kroos, Ozil, Muller, Draxler, Gomez. Buffon, Barzagli, Bonucci, Chiellini, Florenzi, Parolo, De Rossi, Giaccherini, De Sciglio, Pelle, Eder. GER vs ITA Euro 2016 quarterfinal match will start at 9 p.m. local time (12:30 p.m. IST). Singapore: TV: Eleven Singapore, ABS-CBN, and Singtel. 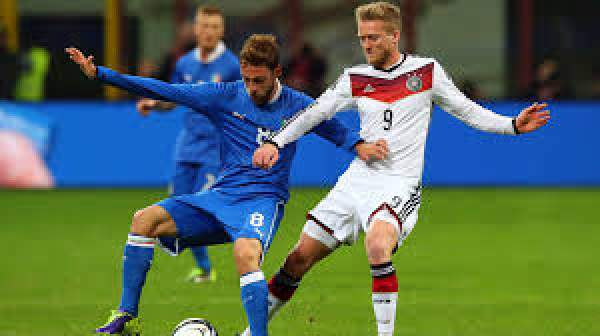 Germany vs Italy Live Score Live Stream: Singtel Go. Stay tuned to The Reporter Times for the match result, full highlights, complete scorecard, and much more details. Who do you think will win today’s quarterfinal match? Share your views and thoughts. Don’t forget to share it on social media.